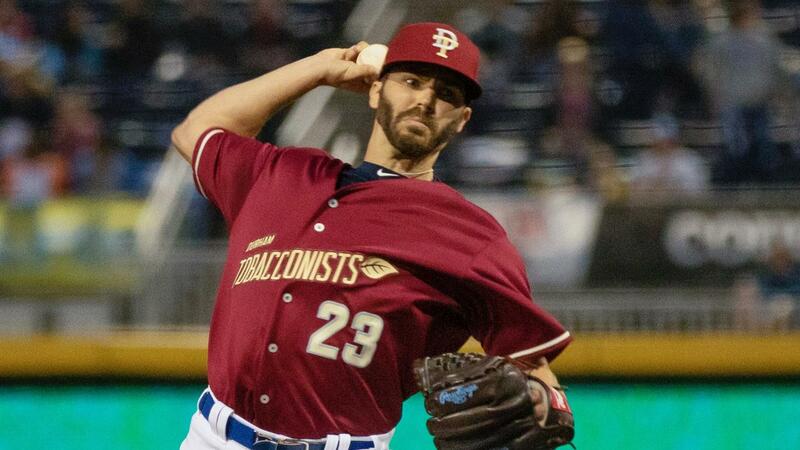 DURHAM, NC - The Durham Bulls, playing as the Durham Tobacconists, won their first game at home this season by a final score of 4-3 over the Columbus Clippers, powered by a four-run seventh inning Saturday night at the DBAP. Austin Pruitt won his first game of 2019, while the Clippers bullpen failed starter Michael Peoples, who tossed 5.2 innings of three-hit baseball. Bulls starter Aaron Slegers went toe-to-toe with Peoples, with his one blemish coming in the fourth inning on a Trayce Thompson RBI sacrifice fly. Slegers finished his outing after five innings, allowing one earned run on six hits, walking three and striking out three. The Bulls offense made their charge in the seventh inning, starting with a walk by Nate Lowe and a single by Jason Coats to give the Bulls their most baserunners of the game at that point. Jake Cronenworth extended his hitting-streak to eight games by bringing home Lowe and tying the game at 1-1. Mac James registered his first hit of the season at the right moment, bringing in Coats and putting the Bulls in front for good. Thanks to an error by Jason Kipnis, the Bulls were able to record two more runs on a botched pop fly to right field to make it 4-1. Clippers relievers R.C. Orlan and Nick Goody combined to allow four runs (two earned) on three hits, with Orlan (0-2) taking the loss and Goody registering his first blown save of the season. Pruitt played a pivotal role in the win, thanks to two sterling innings of relief, in which Pruitt tallied five strikeouts and allowed just one hit, improving to 1-0 on the season. As a whole, Bulls pitching recorded 11 strikeouts and allowed eight hits. Columbus made some noise late, thanks to an error and a two-run single by Yu-Cheng Chiang to cut the deficit to 4-3. However Emilio Pagan continued his early season success, securing his second save of the season. The Bulls wrap up the series against Columbus on Sunday, with right-hander Casey Sadler (0-0, 2.25) making his first start of the season opposite Asher Wojciechowski (0-0, 1.50) for the Clippers. First pitch is set for 5:05 p.m.